It brings me great joy to introduce one of WISPA's newest members. Steve Stroh is much more than a journalist of our industry. He is a pundit, a visionary and a true friend to WISPs. I have been very fortunate to be able to get to know him well enough to call him a friend of mine personally. If ever there was a true litmus test for WISPA to be fully vested and entrenched in the culture of this industry this day surely marks it with this introduction of Steve Stroh as an Associate Member of our association. Welcome Steve! I started writing about WISPs and what I now call the Broadband Wireless Internet Access (BWIA) industry in April, 1997 with a column in Boardwatch Magazine called Wireless Data Developments. The column explored the (then) odd concept of ISPs using wireless instead of dialup, ISDN, or the brand new technology of DSL. In the following years I ended up writing about BWIA for a number of magazines such as Broadband Wireless Business Magazine. The writing looked sufficiently promising that in 2000, I quit my day job as a System Administrator for a large company to write full time. But within a year, the dot-com crash hit, and all the freelance writing jobs evaporated. So I started a newsletter, FOCUS On Broadband Wireless Internet Access so I could continue to tell interesting stories about BWIA vendors, technology, and service providers. About the same time I started dabbling in writing a blog, sometimes independently, other times for another company (which was a really disappointing experience). Eventually I started my BWIA News blog, which I've really enjoyed doing. In 2004, my friend Marlon Schafer recommended me as a co-host for a new web-based talk radio show being produced by Jim Sutton called Wireless Tech Radio. Marlon, Jim, and I had a lot of fun with WTR and we kept it going for about year and a half, but eventually the financial and editorial overhead got to be a bit much and Jim had to focus on finding a full-time job. I'd always done some consulting, and in late 2005 and all of 2006, I landed a couple of long-consulting jobs which prevented me from writing very much about BWIA. While I was doing the consulting work, I saw a new opportunity to write about BWIA in a more powerful way. Blogs had gone mainstream - when they're done right, blogs now filled the role previously occupied by newsletters, and the new revenue model was advertising and sponsorships. Using blogs made it possible to build a much bigger audience, but you had to "open source your content", not try to restrict it only to subscribers. I had always written about the "big picture" of Broadband Wireless Internet Access as I saw it - encompassing what I considered sub-industries of BWIA such as cellular broadband, satellite Internet access, WISPs, metropolitan Wi-Fi networks, WiMAX, etc. But in the last couple of years I realized that that all of these "sub-industries" consider themselves "standalone" industries; WISPs didn't see themselves competing against metropolitan Wi-Fi networks; satellite Internet access didn't see themselves as being in the same business as cellular broadband, etc. So... I had the idea of individual blogs that discussed each "BWIA sub-industry", and a few about specialized topics such as BWIA operating faster than 1 Gbps, a blog dedicated to Clearwire, WiMAX systems for license-exempt spectrum, dedicated coverage of WISPs (http://www.wispnews.net), etc. might all find their own unique audiences. I laid out this vision to my wife Tina over dinner one night in December 2006. We ended up talking about it late into the night and she agreed to help make my idea a reality by forming Stroh Publications LLC. Tina put her very strong organizational abilities and her background in business and marketing into the company as Business Manager, and my role as Editor / Analyst is to write full time for the portfolio of blogs. Tina's vision for Stroh Publications LLC extended even further than mine and she surprised me by purchasing the assets of Wireless Tech Radio from Jim Sutton, and hiring a very capable producer to help me restart Wireless Tech Radio later this year. We've also restarted publication of the newsletter, renamed FOCUS On Broadband Wireless Internet Access and WiMAX, reflecting the profound effect that WiMAX is having on the BWIA industry. I'm really proud to have watched the WISP industry almost from its inception and having had a minor role in helping it grow with my writing, my presentations at conferences such as ISPCON and WISPCON, co-hosting Wireless Tech Radio, and consulting. I think that the WISP industry's best and most interesting days are in the immediate future, not the past. WISPs finally have much of the technology that they've always needed, and with 3650, 5.4 GHz, and television whitespaces, they'll finally have good... and enough... spectrum to provide services to a large base of new users, especially in rural areas. We're seeing serious investors seeking out and willing to invest in (or purchase outright) well-run WISPs. There's a dramatic shift occurring in the ISP industry with users demanding higher speeds to support video, (legitimate) peer-to-peer distribution, and incredible waves of innovative "Web 2.0" services. That shift is catching the telcos and cable television companies unprepared to make the enormous investments needed to increase the speed of DSL and cable modem networks, and that represents a huge opportunity for Wireless ISPs. While WISPA has some challenges in its path, its founders did the slow, careful, and at times painful work necessary to insure that WISPA could, and would become the organization that the WISP industry needed... and could be proud of. I'm very proud that Stroh Publications LLC has been accepted as an Associate Member of WISPA, and in the coming years I hope to be able to help WISPA in more direct ways than just being a member. Tina and I had hoped to meet with many WISPA members at ISPCON Fall 2007 in San Jose, but some lingering medical issues resulted in me being unable to travel during October and November. My wife Tina and I were privileged to visit Tranzeo Wireless Technologies, Inc. in March, 2007. Our visit was at the invitation of Vice President of Sales and Marketing, Tony Kott. Tranzeo is located in Pitt Meadows, British Columbia, Canada, near Vancouver. Tranzeo is a primary supplier to the Wireless Internet Service Provider (WISP) industry, with products specifically designed, marketed, and supported for the WISP industry, especially the WISP industry's "agressive" cost points (low prices). I had been curious about Tranzeo for some time, specifically, how Tranzeo could offer such a high-quality product, at low prices, and ostensibly manufacture and support it with North American cost overhead. All equipment was (what appeared to be, from my limited knowledge) state of the art, including high-speed pick-and-place robotic circuit board assembly units, fully automated soldering systems, and very impressive post-manufacture testing systems. The overall atmosphere was bright, pleasant, and relaxed; it seemed a very pleasant place to work. There were no "buzzers" indicating break time, start/stop time, etc. We arrived just after lunch time, and the employees were just returning to work from the daily company-supplied lunch. These first impressions answered one immediate question about Tranzeo - unlike so many vendors of low-cost products to the WISP industry, Tranzeo is far, far more than the typical "garage shop assembler", merely assembling commodity parts. Words don't do justice as to how impressive Tranzeo's facility really is, and although we weren't allowed to take our own photographs, Tranzeo later provided us with authorized photographs; the captions are my descriptions. The only electronic units that Tranzeo does not make in-house are the radio cards (supplied by vendors such as Atheros) and portions of its 900 MHz radio. All other electronics - the router boards, are designed and manufactured in-house, including firmware. Tranzeo subcontracts its enclosures and antennas. Tranzeo doesn't appear to manufacture the bare circuit boards in-house (I didn't see a printed circuit board process - only circuit board assembly). Early in our visit we were joined by Vice President of Product Development Damian Wallace, who helped explain the technology that is used to manufacture its products as well as the technology that goes into Tranzeo's products. One of the first things I wanted to understand was Tranzeo's sudden emergence into the WISP industry several years ago. I was very impressed to learn that Tranzeo was established solely to develop products for the WISP industry. Tranzeo saw a need in the WISP industry for low-cost, high-quality Broadband Wireless Internet Access systems that wasn't being filled by products and companies that designed and sold products mostly for telecommunications carriers and merely "deigned to sell" their products to the WISP industry. Low-priced products for the WISP market were often poorly-designed, almost always poorly supported, and surprisingly often were sold with no regulatory certification. Tranzeo doesn't seem to have "evolved" from the "garage shop assembler" type of operation, but rather was established and funded to do what we saw them doing during our visit. The only differences from when Tranzeo was founded was that of growth, scale, and excellent acceptance from its targeted market. For example, Tranzeo had previously subcontracted circuit board manufacturing, but grew frustrated over quality, delivery, and ability to rapidly update features and so decided to manufacture their own circuit boards - at a cost of several million dollars. Tranzeo has outgrown its previous facility, grown from a handful of staff to 102 at the time of our visit, and evolved from being privately funded from "friends and family" to being a publicly-owned company (TZT on the Toronto Stock Exchange). Tranzeo builds Broadband Wireless Internet Access products that comply with the three major "wireless" regulatory agencies - US Federal Communications Commission (FCC), European Telecommunications Standards Institute (ETSI), and Industry Canada. It supplies products to over 2400 unique customers (mostly Wireless Internet Service Providers) through 18 distributors worldwide (60% of sales), as well as direct-to-end-customer sales (40%). With a staff of 102, Tranzeo builds approximately 500 units per day on a single shift. We started the tour seeing the circuit board assembly area. As a former electronic technician, I was very impressed with the working conditions - all work areas were very well lit and well-laid out with comfortable benches. All personnel were supplied with ergonomic furniture and tools, and fume hoods removed all traces whatsoever of fumes resulting from chemicals, soldering, etc. I was told that Tranzeo meets the (European?) regulations for lead-free electronics. As mentioned, Tranzeo uses several impressive robotic pick-and-place automatic circuit board assembly systems. The systems operate so fast that all you can see is a blur. It's probably commonplace for such systems, but I was impressed that the circuit board assembly systems don't merely "blindly place" components, but rather employ artificial vision systems to insure that all the individual components are correct, as well as placed correctly on the board. Only Tranzeo's older systems have through-hole circuit boards; all their newer circuit boards are surface-mount. An example of Tranzeo's attention to detail is that it manufactures its own "pigtails" - the very small coaxial cable that connects from the radio card to the external antenna connector (or assembly, such as a Radio Frequency [RF] lightning arrestor). Pigtails are maddeningly exacting - the connectors are tiny on the radio cards - tough to mount on a circuit board, but very tough to mount on a coaxial cable the size of a pencil lead. I've heard of WISP vendors that buy their pigtails from high-quality suppliers and go to the extra effort of 100% testing with RF test equipment, but Tranzeo is the first WISP vendor I've heard of that builds their own pigtails from scratch. Tranzeo paid $50,000 for the specialized machine (no hand tools) which precisely strips the coaxial cable for a pigtail - exactly the right lengths of the center conductor, center conductor insulator, outer braid, and outer jacket, with absolutely no nicks. Specially trained personnel assemble the pigtails, which then undergo "200% test" - each pigtail is individually tested, and the the pigtail is also tested as part of the fully-assembled system. Pigtail testing is performed at 2.4 GHz and 4.9 - 6.0 GHz. Wallace explained that cheap OEM pigtails are a key failure point in many products similar to Tranzeo's, and this sort of attention to detail has markedly decreased Tranzeo's in-field failure rate. Although Tranzeo does not manufacture its radio modules, it "characterizes" them to a surprising degree. Tranzeo uses a "Veriwave HotSpot Simulator" to test 100% of the radio cards it uses in its products. This unit provides a "characterization signature" for every individual radio module, and Tranzeo retains this "signature" data indefinitely for quality control, product development, and product support (they know exactly how much power each radio module can transmit, and what its receive sensitivity was as it left the factory). Tranzeo also "flashes" each radio module to maintain absolute consistency of radio firmware so there is no variation from unit to unit. Tranzeo is an Atheros licensee, so it has "privileged" access to the inner workings of Atheros wireless modules, with the corresponding ability to "tweak" various parameters such as frequency selection. Network design - how do you scale your systems and networks from 20 users to 200 users and beyond. The necessity of lightning protection, and how to do lighting protection properly. Taking into account Line of Sight / Fresnel Zone issues to engineer a reliable network. To summarize our visit of the Tranzeo factory, we were very impressed with Tranzeo's use of state-of-the-art electronics manufacturing equipment, a dedicated, motivated, and apparently happy workforce, that there are few or no inefficiencies in Tranzeo's production, resulting in Tranzeo's ability to offer high-quality, reliable products at agressive prices. In Part 2: Tranzeo's Plans For The Future, I'll detail the wide-ranging discussion we had about Tranzeo's future, including some surprising new directions that Tranzeo intends to explore. April 2007 marks a full decade that I've been writing professionally about what I now call Broadband Wireless Internet Access (BWIA). Although I cannot find where and when he said it, some time prior to the April, 1997 issue, Boardwatch Editor Rotundus (his self-conferred title) Jack Rickard abruptly transitioned the magazine from covering both the Bulletin Board Service (BBS) industry and the fledgling Internet Service Provider industry, to just the latter. He also invited those who had ideas for new columns to submit their ideas. I submitted a writing sample and a proposal, and heard from a Boardwatch editor in approximately January-February 1997 to "start writing". In those first few years of Wireless Data Developments, I struggled to explain to the new Internet Service Provider industry about the benefits of using wireless technology to provide the last mile between the ISP and the user. The topic of the column and I were met with a lot of outright skepticism, not the least of which was from Editor Rickard who I never met or talked to the entire time I wrote the column, and later feature articles. Rickard only told me years later that his opinion then was "This guy [me] can't write worth crap... but let him keep trying". I don't think Rickard ever really got wireless, even though he did finally get to see the realization of what I had been talking about for all those years by attending a WISPCON - Wireless Internet Service Provider Conference where Rickard saw for himself that the small entrepreneurial ISP that was so beloved to him and Boardwatch was alive and well... just now using wireless. Wireless Data Developments opened the door to other writing opportunities about the subject of Broadband Wireless Internet Access. 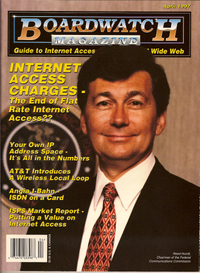 I particularly enjoyed writing for Broadband Wireless Business (now also apparently defunct) in its early years. Wireless Data Developments lasted about five years, and Boardwatch didn't survive for too much longer, a victim of two ownership turnovers, loss of passion (and Rickard), the devastating downturn in the tech industry, the movement of advertising and readership to online, and trying to cater the content to what the big advertisers wanted rather than keeping the content relevant to the core audience of smaller, entrepreneurial ISPs. One proud moment with Boardwatch came in January, 2002 with the publication of what I submitted as my last column, but ended up being barely sandwiched into the magazine as an article called Wireless Smart Radio, Heavy Lobbying Would Bring Wireless ISP Band. I've told that story previously on this blog. As far as I'm aware, this was the first article in print that proposed what are now called Cognitive Radio Techniques that would allow Broadband Wireless Internet Access to effectively share unused television broadcast channels (now called "TV Whitespace") while protecting legacy television broadcasting. Such a proposal is now under active consideration at the FCC, backed by companies such as Microsoft and Cisco. But my proudest achievement in ten years of writing about Broadband Wireless Internet Access was that I conveyed information of worth to readers. I taught them things, and about things, that they otherwise wouldn't have known about or understood as well. Over the years, many have told me that they've appreciated my writing, and being told that is very gratifying. During these last ten years, especially the past seven writing full time, my wonderful wife Tina has supported me in every conceivable way. I couldn't have written at all, but especially couldn't have written as much or as well, without Tina's unflagging support. Thank You Honey!